With regard to Dwight Swain...I finished my storyforming, my scene planning, and now I'm about to get into the actual scene-writing. I've been planning on attacking each Scene/Sequel with Dwight Swain's MRU way of writing, using advice from other places about looking through the lens of a movie director. I've been glad to find several posts where others are trying to incorporate these things. I am slowly reconciling myself to the idea that it's not really possible for me to write from both "inside" the story (storytelling) and "outside" at the same time and that in order to use Dramatica I have to figure out how to flip back and forth. There's a weird and sometimes uncomfortable feeling with that -- as a reader/viewer/creator I want to inhabit the world of story, not pontificate about the "perspective on an inequity". You've got the sugar backbone of the DNA strand, which holds everything, by chemical bonds, one to the other. And you've got the CODE INFORMATION that's going, in some logical progression within the center, the heart of the DNA. Without the structure outside, the inside won't stick together and can do nothing, it flops. This is a story that's only "without" which pantsers are afraid to write. They want the guts. The little ACGT in varied connections and lengths and patterns. Without those letters inside, DNA has no function, goes nowhere. But without the sugar backbone in the first place, telling the ACGT where to line up (in the Coded order) you have all emotion and no story. Anyway, that's just a parallel that works for me, coming in late to last year's Dwight Swain discussion. Since so much of Dramatica is a formula, we want the creative bit--the "insides" to be formula, but it takes that Code (Encoding) of a Mind to put meaning into a random structure. The more I'm thinking about it, as I'm going through the Appreciations, I think they're called--the 4 topics to be covered under a signpost--I find that the opposites somewhat resolve each other. In act one, "what has already happened" (The Past) is explored in terms of Closure, Hope, Dream, and Denial. Act two concentrates on "the way things are going" (How Things are Changing) and is explored in terms of Value, Confidence, Worry, and Worth. Act three focuses on "what will happen or what will be" (The Future) and is explored in terms of Investigation, Appraisal, Reappraisal, and Doubt. And act four illustrates "the current situation and circumstances" (The Present) and is explored in terms of Falsehood, Truth, Evidence, and Suspicion. 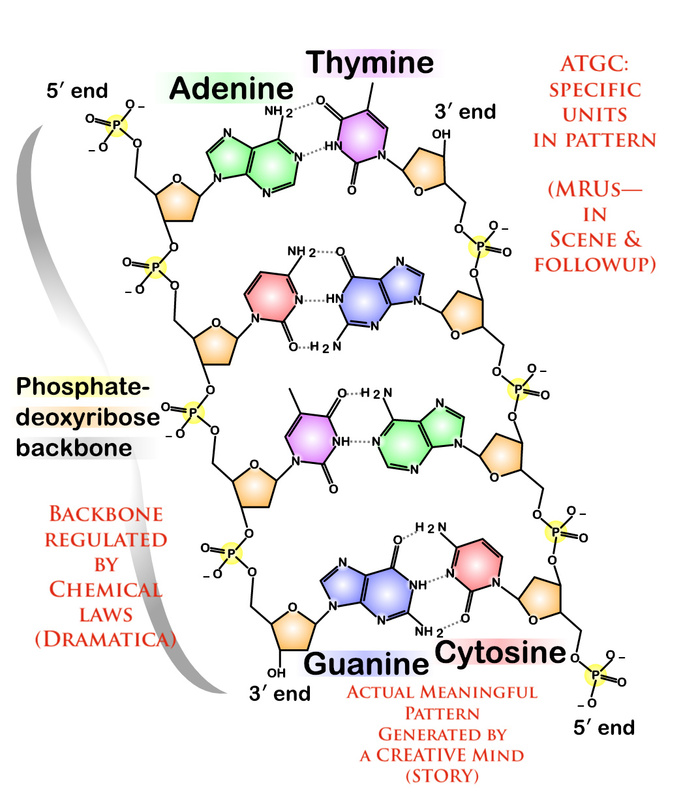 Both systems work like matches (How Guanine and Cytosine match up or Adenine and Thymine do. But even these are in pairs, positives to negatives. Decision to Goal in a cycle. Looking more and more like ATGC and chemical reactions. I've been meaning to start another thread asking about Dramatica and the Scene/Sequel approach at some point. I feel as though there is some productive connection that could be made, but I'm not quite sure how to make it. ... which I feel could be very useful if I could wrap my mind around it. I'm still not sure if or how it maps to Swain's approach. Jim seems to think that getting in the weeds on scene structure is not necessarily always practical (though it's interesting). In my case, I have recently had trouble driving a few scenes forward, so I've needed some help. It's not hard for me to see how the Dramatica modality of SRCA (Setup, Revelation, Conflict, Aftermath) could roughly map to Goal, Conflict, Disaster. What I'm trying to figure out is if there's any analogy to the reaction beat -- Reaction, Dilemma, Decision. Somewhere I think Jim also mentioned how SRCA connects to Armando's approach but I can't remember where. It's not hard for me to see how the Dramatica modality of SRCA (Setup, Revelation, Conflict, Aftermath) could roughly map to Goal, Conflict, Disaster. I've been using Jim's scene guidance for a while. My feeling is that Goal, Conflict, and Disaster are more from the characters' point of view while Dramatica scene modalities are still from the Author's point of view (but highly focused on the context of the scene, so WAY more zoomed in than the whole-story storyform's perspective). Disaster (which I feel is poorly named) is usually found in the Outcome of a scene in the PRCO (Potential, Resistance, Conflict, Outcome) modality. But I don't think it always is. One thing that Jim has mentioned, which I wholeheartedly agree with, is that the KTAD modality is the most effective for writing. Basically you make sure the scene has an Attitude, a Manner of Thinking, a Situation and an Activity. If it's missing one it won't feel complete. And by holding one back (maybe just hinting at it) until the end, you give the scene's conclusion more power, more "oomph". I sometimes layer PRCO onto that, but it's usually more because I'm procrastinating and having fun with theory than because it helps me write the scene. What I'm trying to figure out is if there's any analogy to the reaction beat -- Reaction, Dilemma, Decision. I've thought about this from time to time and had trouble finding the connection. My current guess is that often my Sequels are just a handful of sentences, while my scenes run 1000-2000 words. With maybe certain Sequels having more weight and I don't notice that what I consider a scene actually fits Swain's Sequel definition better. I'm also not sure if writing a Decision-driven story would change things (my current one is Action). Finally, I wonder if Swain's distinction is somewhat artificial, and the really important thing is just to make sure you have both Actions and Decisions in your story (with the right one driving the other). by holding one back (maybe just hinting at it) until the end, you give the scene's conclusion more power, more "oomph"
Interesting premise. I wonder if I should write one scene twice, once from each methods, and see which one resonates more. In life we really don't think about "I'm deciding on doing this," "doing this." Some very important moments in our lives get that kind of consideration, like who to marry, where to go to university, accepting a job offer. Otherwise, who we are creates the things we do based on a thing in the back of our head that decides. How do we decide? character + appetite + opportunity. Most people who don't think about the internal structure of a scene, probably most new novelists, try to build tension by the intensity of the action happening. A child is kidnapped. A ransom note is received. Actions drive "what do I DO now." Which almost skips the decision/ weighing stage of those BIG choices--BIG because the costs are high. Otherwise, the non "tension" scenes just go on and on, like our everyday lives. Unknowingly deciding and acting, without really thinking too much about weighing our options or feeling stressed. But Swain's approach (I'm not familiar with the KTAD model--I'll look that up) says that "if you want to SELL YOUR BOOK, you've got to think about the Decisions and reactions. Because, I think, when you're talking about "a Story Mind" while we approach problems with all these elements, we DO react and decide inside almost without thinking about it. But the passions we live are these things. We may call it "personality" or "Way I respond" but we don't think about responding -- we REACT (or act). We DO, and don't know how we decided, but feel passionately that we DECIDED right. I wonder if I should write one scene twice, once from each methods, and see which one resonates more. Or try using both on the same scene. The methods aren't exclusive -- you can apply one after the other. When setting up a scene I routinely use Holly Lisle's PACTS method (very similar to Goal, Conflict, Disaster except that it also reminds you about Setting) first, without any Dramatica thinking. Then, armed with a reasonable conception of what the scene is, I try to suss out what the KTAD items might be. Sometimes there are blanks or question marks, but that's okay -- things always become more clear once you start writing it. I Love this thread. Being a science guy myself, it makes perfect sense. When working on scenes, I use EVERYTHING!! Although I use the Dramatica way as the foundation. I've come to realise that emotion and engagement is all that truly matters with readers/ audience. First, I try to define how I want the scene to feel. PRCO helps me see what ingredients need to be present in the scene.Then I mix and match the SRCA or 1234 (Last) for my intended effect. This will inform how I layout the scene. It's particularly useful when combined with the Audience perception chart. For me, scenes are great for the OS Throughline and Sequels are particularly useful when exploring the MC Throughline. There are a whole host of tools out there. My advice, DO WHAT IT TAKES TO GET A GREAT STORY OUT. Yeah, and this is both an advantage and potential limitation. I think Goal for Swain from the POV character's perspective -- but that might not be the actual scene goal from the author's perspective. I've thought about this from time to time and had trouble finding the connection. My current guess is that often my Sequels are just a handful of sentences, while my scenes run 1000-2000 words. So this hints at what seems most useful in Swains approach from a storytelling perspective -- Swain says the function of the Sequel is to a) translate the Disaster into Goal b) telescope reality and c) control tempo. Especially as regards b and c, this gives a structural framework for putting in all of those things that can be hardest to handle -- summary, exposition, flashback, character development, etc. I wonder if Swain's distinction is somewhat artificial, and the really important thing is just to make sure you have both Actions and Decisions in your story (with the right one driving the other). Maybe this is the answer. I always think of Drivers as happening at the Act level. But do they also happen at the scene level? And by holding one back (maybe just hinting at it) until the end, you give the scene's conclusion more power, more "oomph". Okay I am totally going to try that. Being a science guy myself, it makes perfect sense. Glad someone gets the "nitty-gritty" of my analogy. I'd like to have a strong view of scene before I dive in. I can empathize with Chris Farley's character in Almost Heroes when he's trying to learn the alphabet. I'll try to pull my head around this. In Jim's example that @didomachiatto links to, Jim is using Knowledge, Order, Chaos, Thought for all of the scene modalities. Here is my process. Note, often I just jump into writing the scene without doing the below, but then come back to these steps if/when I have any trouble with the scene. Figure out the scene (what it's about, setting, protagonist, goal, conflict, disaster/twist). Figure out / guess at the Situation, Attitude, Activity, and Manner of Thinking (KTAD). Often these are imperfect guesses, with a lot of question marks. Things clarify as the scene gets written. If I really think I need to, or am just procrastinating, try to assign PRCO to the above. Sometimes I feel like knowing the Element quad* might help. I can't always figure one out, and usually don't try. But, sometimes it can be really fun to guess at. I've learned that if I try to guess at it before I start writing, I'm almost always wrong. So, I generally do this step after I'm partway into a scene. When I get this to work it's because one element really sticks out in the scene, and its dynamic pair seems to be in there too. So then I look at all the 4 quads with that element, and see if the other dynamic pair is present or fits. Sometimes one quad fits REALLY well, other times I kind of pencil in a couple guessed quads and leave it. * I think a scene is usually based on an Element quad but once in a while it might be another level, like a Variation quad. Maybe if I get a chance later I could post my notes from a recent scene. Pretty stream-of-consciousness stuff but it might help to have an example. This is awesome and helpful. Thanks!